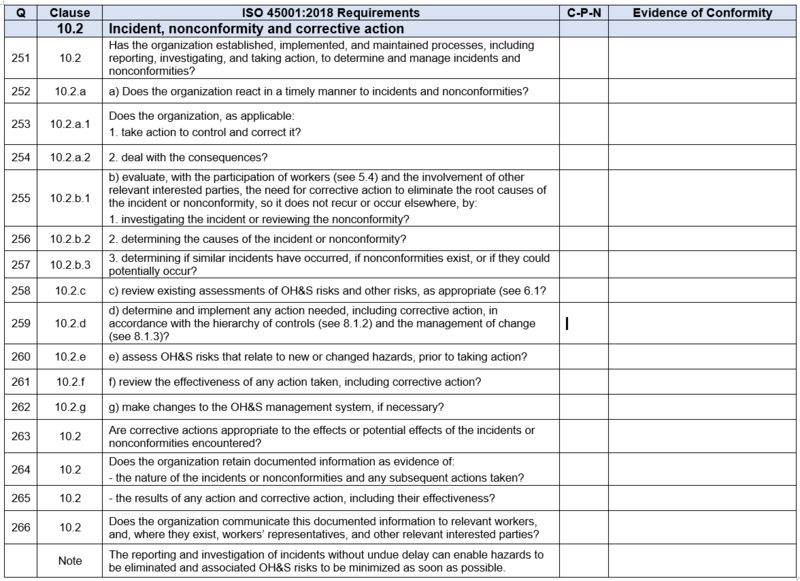 Larry Whittington has developed an extensive, 23-page, Gap Analysis Checklist that contains 271 questions for assessing conformity to the Occupational Health & Safety requirements of the ISO 45001:2018 standard. To purchase the checklist for $95, click on the Buy Now button to be taken to PayPal. You do not need a PayPal account to make a credit card payment and buy the checklist. The checklist will be immediately available for download as a Word file for ease of editing. The checklist has a section for identifying process owners and their managers in a Process Owners table. A Process Matrix includes ISO 45001:2018 clauses as rows and key processes as columns. The checklist can be used to evaluate the process areas with primary responsibility for the applicable requirements. The Status column indicates a C for Conforming, a P for Partially conforming, and N for Not conforming. If not resolved prior to an audit, the gaps indicated by P and N may result in reported nonconformities. After completing the checklist for each sub-clause, you indicate the overall conformity level for each row in the Process Matrix as Green for Conformity, Yellow for Partial conformity, and Red for Lack of conformity. Note: The gap analysis checklist can be used to evaluate the current conformity of an Occupational Health & Safety (OH&S) management system against the requirements of ISO 45001:2018. Additional criteria for an OH&S management system may be specified in customer contracts, regulatory documents, and your organization’s own documents, but they are not considered during a gap analysis. These important other requirements should be addressed in later internal audits.